The wave of anti-government protests that swept through the Arab world from December 2010 on started to transform politics and society in the Middle East. The protests came as a surprise to many observers-- but not to Rami Zurayk, an veteran Lebanese agronomist and social activist who had been analyzing the collapse of traditional agricultural livelihoods in the Middle East since the late 1980s. 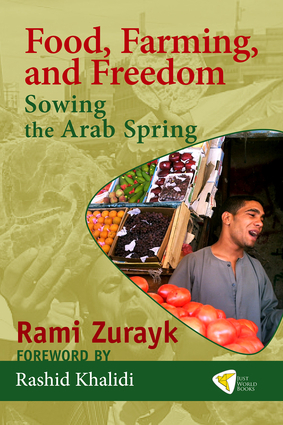 In 2007, Zurayk started writing the "Land and People" blog, which charts food-policy and agricultural policy issues throughout the Middle East. Food, Farming, and Freedom presents his choice of the best of the posts in the blog from 2007 through April 2011. It concludes with a chapter tracking the early months of the Arab Spring. Rami Zurayk is an agronomy professor at the American University of Beirut and a longtime activist for political and social justice. Born in Beirut in 1958, he has witnessed two Israeli-Arab wars, one protracted civil war, one major Israeli invasion, one Israeli retreat, and one Israeli defeat. He has published over a hundred articles, monographs and technical reports on agriculture, food, environment and education, covering numerous countries throughout the Middle East.